Disposable America recently announced that indie rock / dream pop band Burglary Years is set to release their debut LP ‘100 Roses’ digitally and on cassette tape this July. To celebrate, a record release show is scheduled at The Democracy Center in Harvard Square on July 17th with synth pop band Teenender, the one-man drum extravaganza that has been recently blowing everyone away, Chrome Over Brass, and 2014 Boston Music Awards "Punk Artist of the Year", the band that makes you feel feelings, The Hotelier. All of the yeses. The show has a $5-10 donation and is all ages. ► Stream the first single “Hatch” on Absolute Punk now. 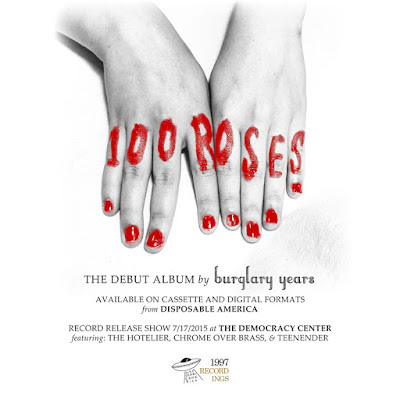 Vinyl pressing of ‘100 Roses’ to be released late 2015 on Dog Knights Productions (UK) & Signal Fire Press. Disposable America is a record label, zine publisher and button maker located in Allston, Massachusetts.